The Tech Works 2528 is a High Power Open-Voice Intercom Amplifier Substation for use with our Voice-Call product line. Amplifier has eight digitally controlled speaker select relays for connecting up to eight speakers. Each speaker can be any 25-Volt or 45 Ohm industry standard unit and has an associated call button input for connection of any normally open or normally closed maintained contact closure, or normally open momentary contact, as well as a call confirmation light output. All of our Voice-Call products employ solid-state control with a special limiting circuit to guarantee clear and consistent audio communication even in the most difficult acoustical environments. The power amplifier is short circuit protected and current limited for durability. The limiting circuit creates an unbelievable amount of accommodation allowing the operator to hear a whisper from a Substation one-minute and a scream the next without distortion or a change in listening level. The 2528 uses our very fast half-duplex VOX circuitry to communicate with any of our Voice-Call Masters over a simple three-twisted pair- wiring network. Our digital control network allows control from any of our Masters or a Personal Computer Interface. Up to (64) 2528 units can be connected to a single expanded network for a total of 512 speaker stations per system. The intercom is housed in a wall mount metal enclosure with a removable top for installer access to adjustments. A 25 pair Amp connector provides easy connection of field wiring via telephone industry standard punch down blocks (not included). In applications such as prisons or security systems, these amplifiers can be located near the speaker stations in an electrical room or terminal closet with just three twisted pair wiring run to the next unit or Master. 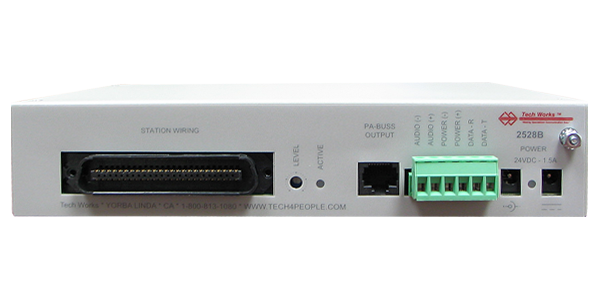 This eliminates the need for home run wiring all the way home to a Master or Central Matrix Switcher. The 2528 uses a local AC transformer to provide power to the audio amplifier. The AC adapter is included and can be plugged into the nearest outlet. All communication is EIA standard 600-ohm telephone audio and RS485 data and when distance is an issue, fiber optic cable, microwave, and even satellite links can be used between units with the appropriate interfaces and local power source.